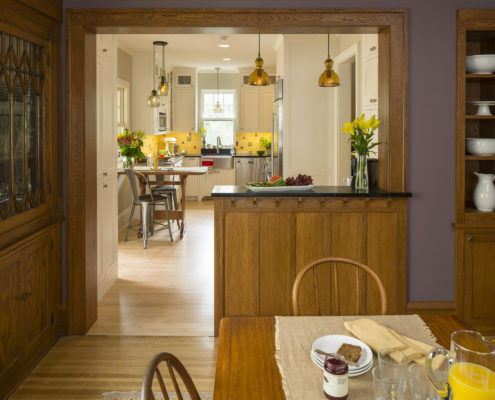 This 1915 arts and craft styled home in the heart of the Mac-Groveland neighborhood of St. Paul was in need of updating to support contemporary living. 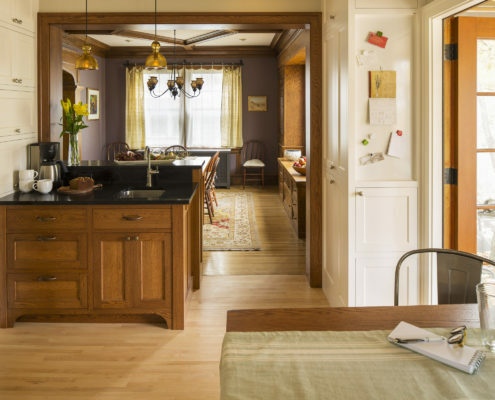 The owners wanted to modernize this traditional four-square but still maintain its historical character. 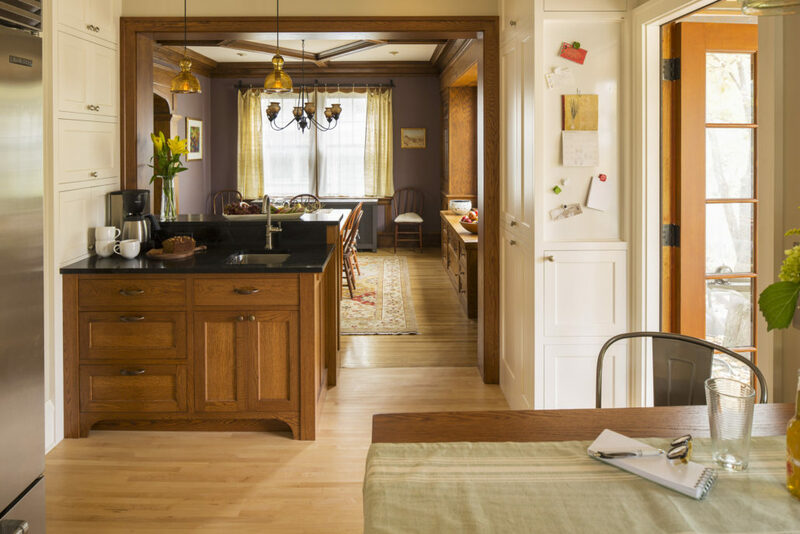 Modifications included a complete gut and reconfiguration of the original and very small kitchen, opening the kitchen to the dining room and a new mudroom at the side yard door; the client’s primary entrance. 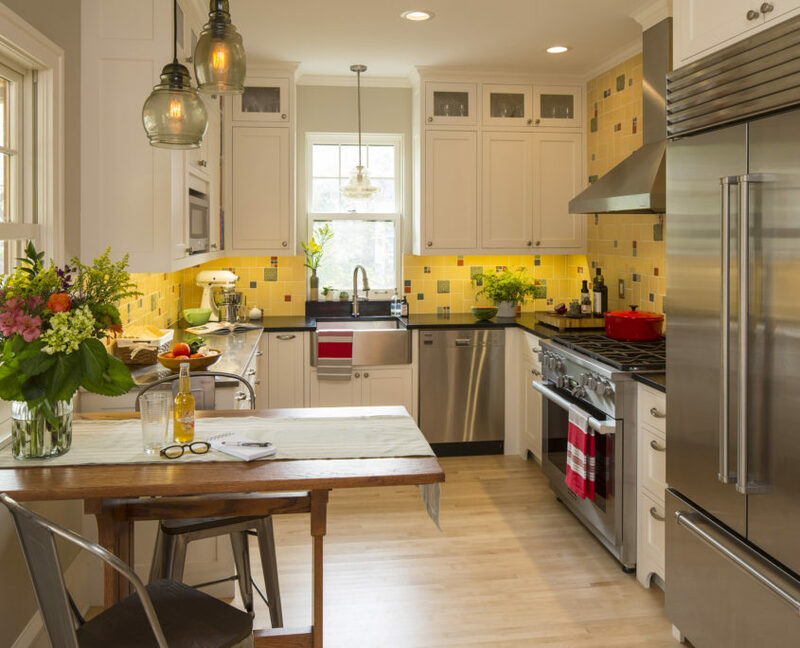 An 8 foot’ addition was added for a mudroom and the kitchen was enlarged 4 feet. 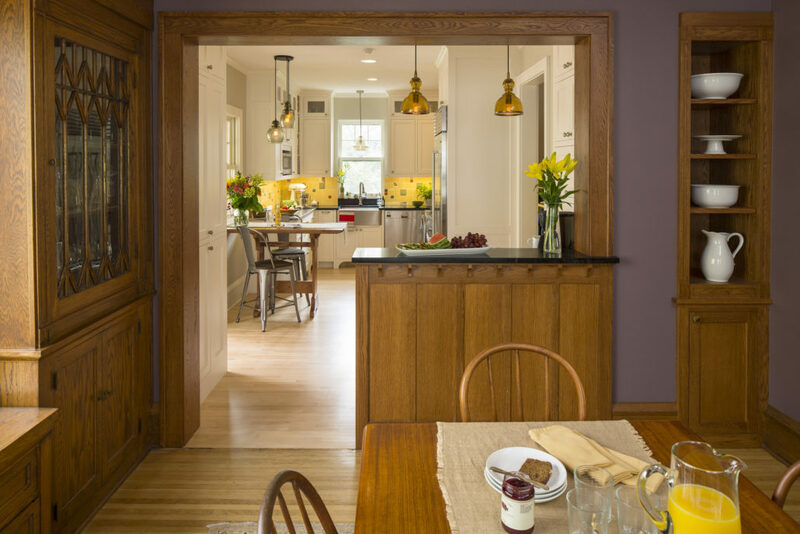 The wall between the dining room and the kitchen was removed and replaced with peninsula in the style of the original dining room woodwork. This joined the kitchen and dining room visually while adding additional counter top and base cabinet space. 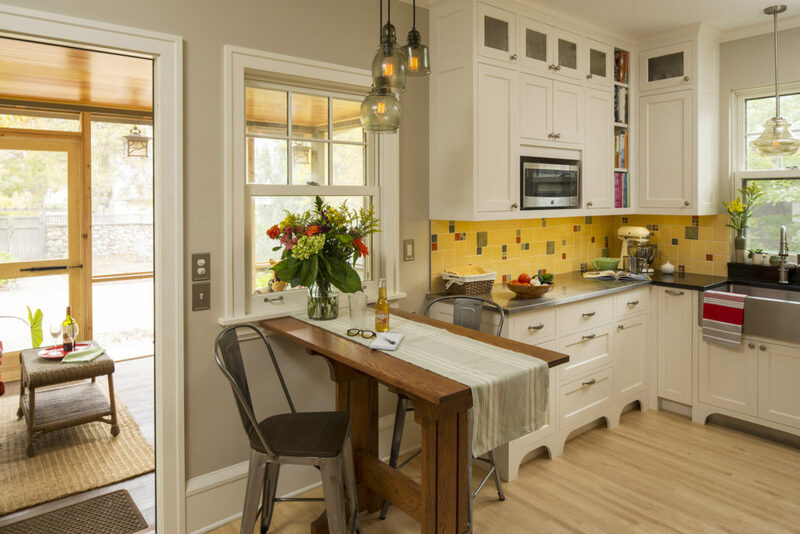 An exterior door and window between the kitchen and the existing screened porch were relocated to provide more countertop work surface in the kitchen. 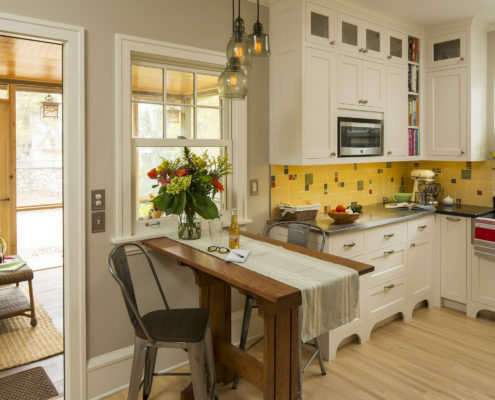 Inset cabinets, the original cabinet style, were used for the new cabinetry and a custom oak breakfast table was designed to reflect the character of the original woodwork. 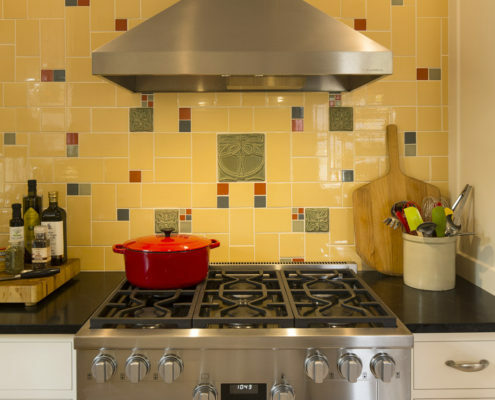 Countertops are soapstone and stainless steel. 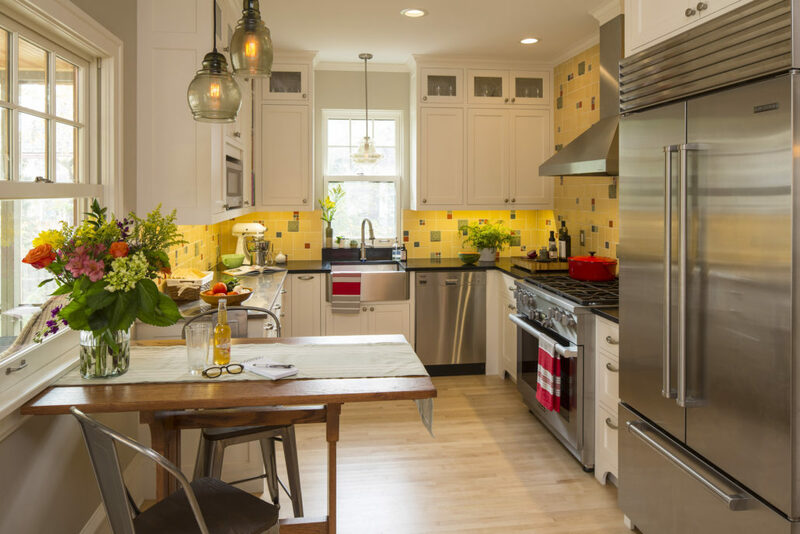 A custom tile backsplash in the owner’s favorite colors became the primary accent of the kitchen with the field color in “butter yellow” (which she loves). 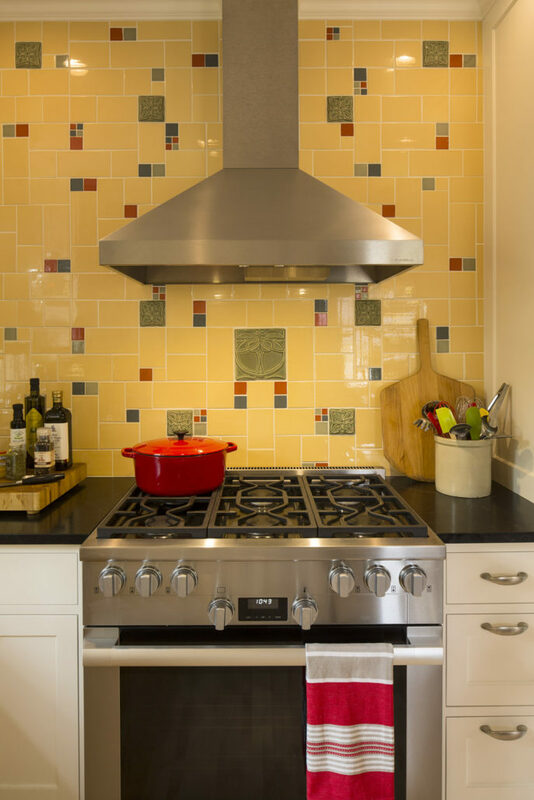 Additional pops of color in persimmon, green and blue in a carefully planned pattern reminiscent of the arts and crafts style. There were 4 different tiles sizes used and each tile was individually placed. The mudroom was finished in low maintenance black slate tile floor and persimmon painted built-in coat cubbies suitable for a family of four.